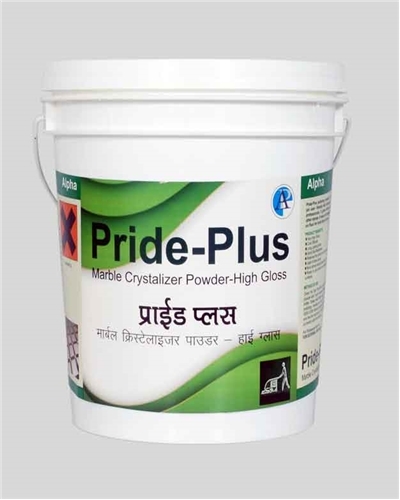 PRIDE PLUS polishing powder is a professional-grade product, yet user-friendly that enables you to polish marble like the professionals. It gives brilliant mirror shine on marbles and other stones. It does not damage floor like other polishes if left on floor for more than 24 hours. Restores the surface to its original appearance and colour. Most stones respond best to this wet method. Ready to use powder for polishing and restoration marble floor surfaces. Clean the floor first with a neutral cleaner. Vacuum dry. Mix 2 parts powder with 1 part of water. Mix the products together in the applicator bottle. Shake well before use as the product does separate. For polishing marble, use with 3M Red polishing floor pads after 3000 -12000 diamond pads buff with red and white pad on the floor and line the machine up on the top of it making sure the pad is lined up evenly under the machine.